The Supreme Guide to the Bell Boeing V-22 Osprey Inforgraphic was created using information that was compiled from Wikipedia’s “Bell Boeing V-22 Osprey” article. It highlights the aircraft’s vital statistics, general specifications, and key performance outputs. The Bell Boeing V-22 Osprey is an entirely unique multi-mission combat aircraft that is manufactured by a joint-service partnership between Bell Helicopter and Boeing Rotorcraft Systems. It achieved first flight on March 19th, 1989, and was introduced into service on June 13th, 2007. This aircraft was designed around the concept of combining the vertical functionality of a conventional helicopter with the high-speed and long-range outputs of a turboprop aircraft. As a result of its fixed-wing and rotary-wing functionality, the V-22 is well-known for its vertical takeoff and landing (VTOL), as well as short takeoff and landing (STOL) capabilities. It is this versatility and robustness that makes the V-22 the aircraft of choice for a variety of challenging roles. In addition to direct combat, the V-22 has the capacity to successfully complete search and rescue missions, provide humanitarian assistance, facilitate aircraft carrier on-board delivery, and can assist with military logistics (ex. the transportation of troops and equipment). Along with that, the V-22 has been built with aerial refueling capabilities, which effectively extends the overall range of the aircraft, allowing it to participate in more lengthy missions. Upon landing, the aircraft’s foldable rotors and rotatable wings make for easy storage and allow for the maximization of space. For speedy reference, an abbreviated summary of infographic data is located below the image. The Bell Boeing V-22 Osprey is an American-made, mulit-mission, tiltrotor military aircraft with vertical takeoff and landing (VTOL), and short takeoff and landing (STOL) capabilities. The aircraft design was based around the concept of combining the functionality of a conventional helicopter with the long-rang, high-speed cruise performance of a turboprop aircraft. First Flight: March 19, 1989. With WinAir Version 7, the latest release of the award-winning company’s software solution, you can track and manage the maintenance activities on any aircraft with ease. 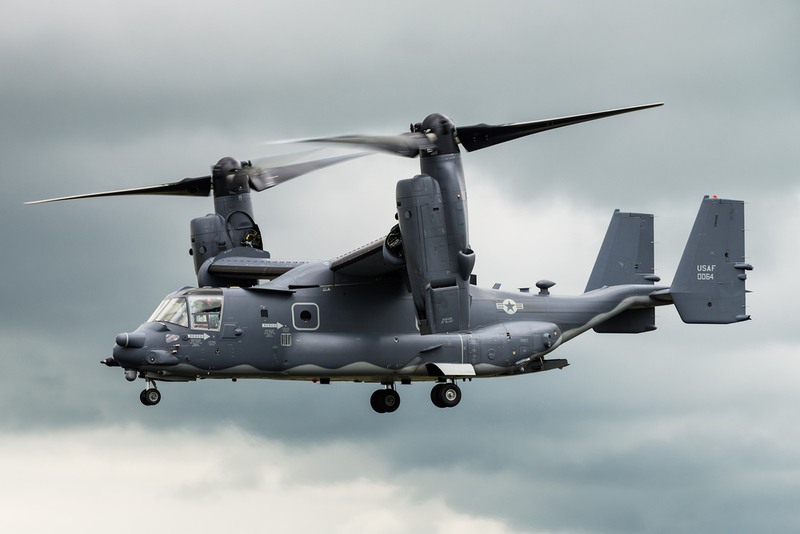 The software has the capacity and flexibility to manage even the most complex multi-engine aircraft-types, like that of the Bell Boeing V-22 Osprey. Regardless of the size of your operation, or the types of aircraft that you command in your fleet, with WinAir Version 7, you can anticipate that business processes will be expedited and maintenance procedures will be simplified. This will lead to an improvement in your operational efficiencies, which can save both time and money in the long run. Since the release of WinAir Version 7, aviation operations worldwide have commented on how the software has seamlessly integrated with their current work environment and has increased their overall business productivity. They have also expressed that they are benefiting from the software’s robust capabilities, data validation functionality, and sequential workflow. This has resulted in significant cost savings and efficient gains for their respective operations. Are you interested in learning more about the business benefits of WinAir? If so, then contact us now to discuss scheduling your time for a tailored demonstration of WinAir Version 7!